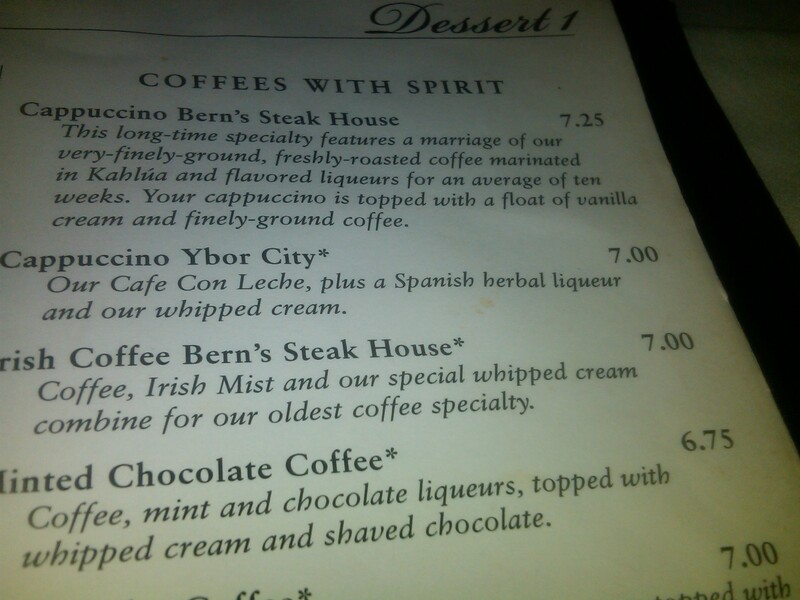 Bern’s Steak House was highly recommended to me, and rightfully so. Few restaurants I have ever been to even compare. It is an experience in and of itself, evident in the fact that I spent spent nearly 6 hours there. Their waiters do an exceptional job, as they are highly trained over a period of one to to years. In fact, due to the intensive nature of their apprenticeship, there is a failure rate of around 60%, consisting of those who can’t pick it up or just don’t really want to do it. The outside looked a bit unsuspecting, as the exterior doesn’t exactly scream “I’m a world-class restaurant,” in my opinion. Matter of fact, it started out as a circus-themed fast food joint. My how times change. I arrived slightly late bit late after my expedition out to Honeymoon Island, and was directed to the lounge room, as my table had been given away. Really, I think it sounds worse than it really is, as they are very customer-centric, and will take in anyone they can, regardless of reservation. Once seated, I was offered a complimentary glass of the finest vintage of extraordinary Tampa tap water on the rocks. Yes that was how Phil, my waiter phrased it, accompanied with elegance and charm. I was asked if I wanted anything else like a cocktail or wine, and as usual when eating a nice meal, I will hold off so I can pair the wine with my food. While managing not to be pushy, my waiter offered me samples of a Chardonnay and Cabernet Sauvignon which he suggested would pair well with the salad and the steak, respectively. That part taken care of, I started through the menu’s several pages, which read like quite the exquisite novel, binding and all. Unlike any restaurant I have been to, the steak section alone covered a couple of pages. 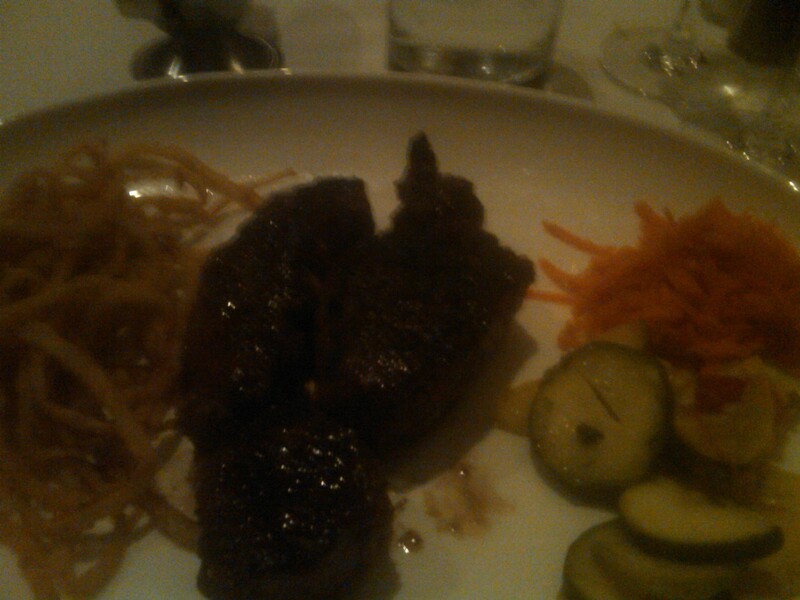 It included detailed descriptions of the various cuts of beef, and analysis of their various textures. I knew steak would be the main part of tonight’s feature presentation, but was intrigued by the long list of offerings. Then it hit my eye–caviar. For various reasons I had yet to try the miniature delectable spheres, but was always fascinated by the thought of having some. Caviar Large soft-skinned beautiful berries. Hand processed by C. Collins from coho and chinook salmon, and not salty. It was pointed out to me that most folks generally enjoy their caviar with a glass of champagne, or for true purists, a shot of vodka, but that neither was necessary to enjoy the fine delicacy. Phil put it best when saying “Do you really need the fancy shoes and clubs to enjoy a round of golf?” And for the record, the sample of the Chardonay (nearly half I glass I might add) drank much like a champagne, and paired well with the caviar. 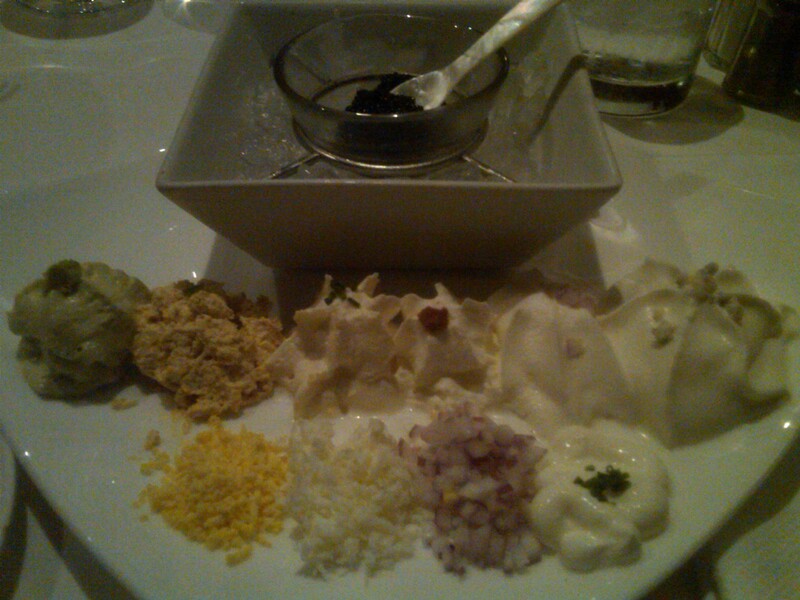 I really had no clue what accompaniments the caviar would fair well with, so as a courtesy, I was given both the traditional cheese, sour cream, diced egg, and onion in addition to some more contemporary options including guacomole, curry, and bleu cheese, and of course provided with small toast squares. In the end, I found I prefer the combination of the caviar with egg, cheese, and sour cream though avocado is also a great fit, in my opinion. As far as the texture, it really is unique in that is unlike anything I have ever eaten before. It tastes and feels like eating fish eggs, with a very subtle saltiness. I ended up adding the caviar on to the toasts and accompaniments so sparingly (or was provided more than normal) that in the end I was dishing up caviar by itself–which is still pretty good when eaten alone. As soon as I finished up the delightful caviar, Phil was on hand immediately to replace the empty plate with my salad. I suppose I should point here, despite the fact the price of a steak at Bern’s is roughly equivalent to what one might pay at a Morton’s or Ruth’s Chris, Bern’s provides a much better deal in that a loaded baked potato, vegetables, both salad and soup are included in the price. As opposed to Morton’s, where a single side of green beans alone can cost one a whopping $14. 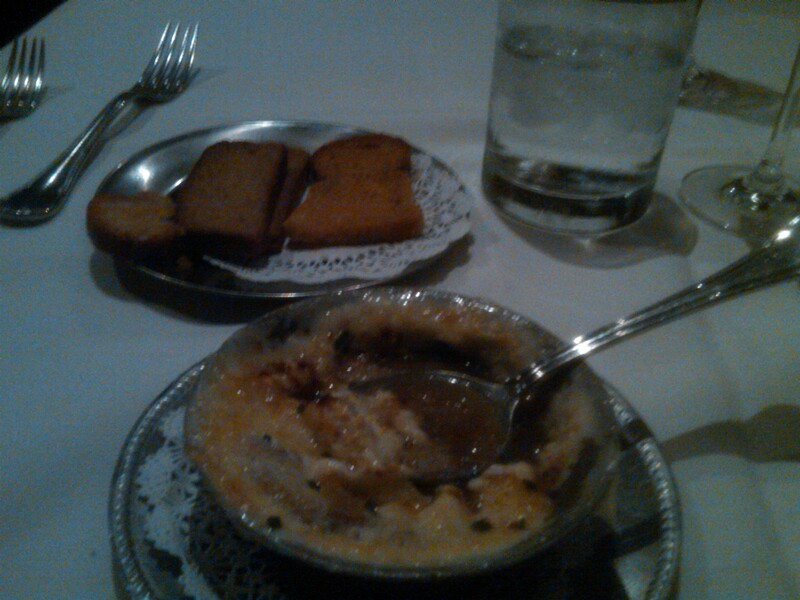 Anyway, I am not a soup kind of guy, but still enjoyed the French Onion Soup with a nice thick layer of cheese on top. 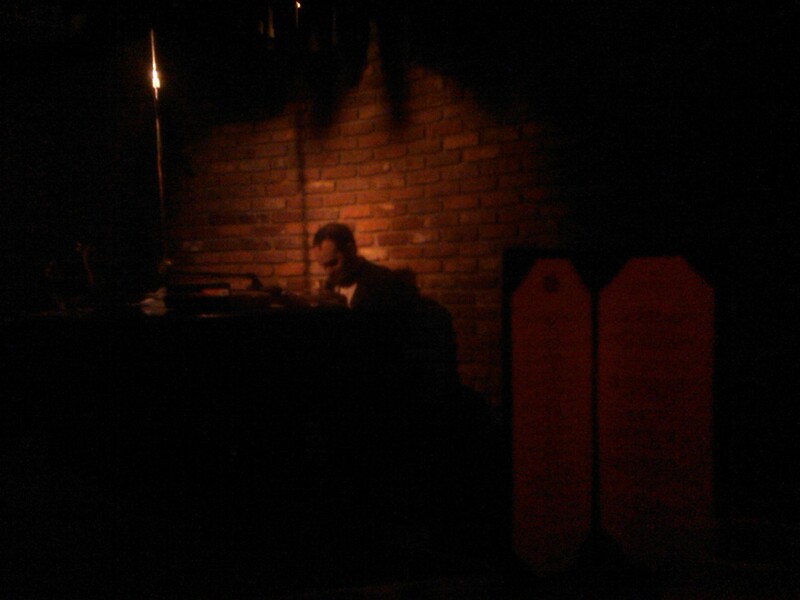 I should apologize for the poor lighting, since I really didn’t feel like ruining the ambiance with a flashing camera. 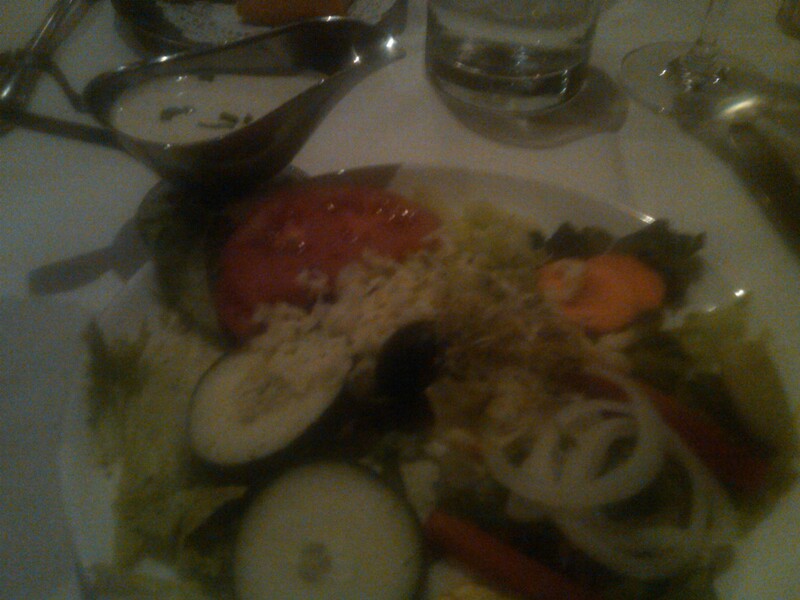 The salad was deluxe yet very refined, while being a bit refreshing. Delmonico is the eye of the rib (called “Rib-Eye” in meat circles). It is known, generally, for its richness; because of the greater quantity of fine fat grains – especially in the outer part of the eye and especially when cut nearer to the chuck end. Some people mistake this outer section for “tail” or flank, but it is absolutely the sweetest and juiciest of beef eating (in our opinion) in the world. Perhaps I should have ordered a larger size, because the way it was plated made it come across as a couple random chunks of beef. This is where I would start to disagree with some Bern’s fanatics about their steaks. Supposedly due to the hickory chips they cook their steaks with, the outside portion of the meat comes across as a little char-grilled burned. Maybe some folks like their steak with a bit of “texture” on the outside, but it was a new steak experience for me. The inside I should note, was plenty juicy, with a good bit of pink. My waiter, Phil, who did a good job so far and was very courteous, while taking time to explain everything along the way. I suppose you could label me as more of a food slob more than a food slob. My father’s epicurean taste in foods had me eating at more sophisticated restaurants early on in life, and even learning to like foods like mussels–which my classmates, even in college didn’t even seem to appreciate. Thus, I had an appreciation for the finer foods, without much knowledge and appreciation of how they are prepared, what makes them good, and what it goes well with. 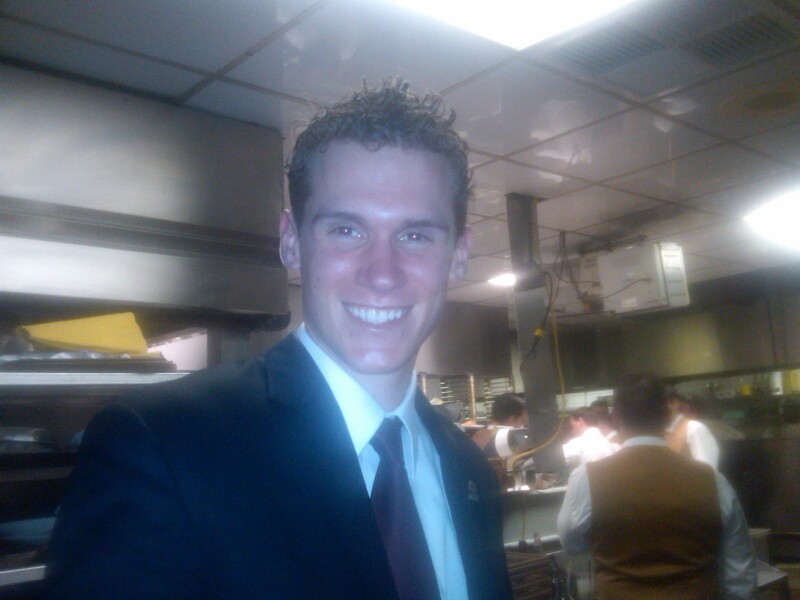 In this respect Phil was a perfectly paired waiter for me, because he hadn’t really enjoyed the “finer” foods growing up, and was being groomed for the world gourmet cuisine with a fresh perspective. In his own admission, he “grew up on a farm in Vermont.” Very well said. I came to trust him though, as he had the knowledge I was lacking. Anyway, up until this point in the meal Phil had done a fine job. When I inquired about the rough texture on the outside of the steak, he spoke out loud “What can be done about this? Can you scrape it off with a knife?” At this point he suggested it was because of the manner in which it was grilled over charcoal, with a crusty outside, while the inside was still nice and tender. Normally, I would have sent this back, and asked for a new one. However, I realized this was still not most steakhouses per se, and that maybe it was after all I new style of steak I could at least try to appreciate. In the end, I dolloped on the butter-rich Bernaise sauce with a little bit of A1, and found it to enhance the flavor. Not a bad cut of meat… just different. As I found out later, they do age their own meat on site, and wait to slice it up until the meat is actually ordered. 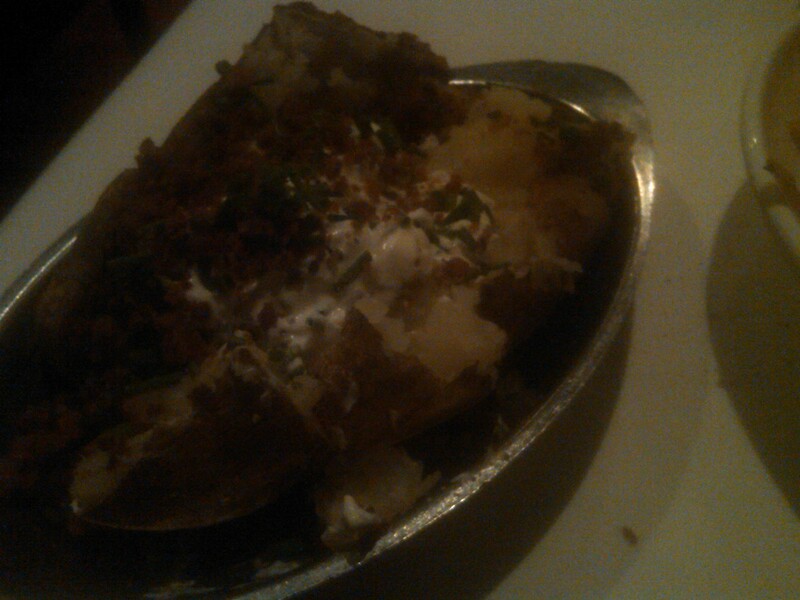 The meal came with vegetables and onion strings, as well as a loaded baked potato on the side, which was pretty good. Of course the one downside to having all of the sides is that it makes one quite full. Upon receiving my bill, I had been seated so long (at this point over 2 hours) that I had forgotten about the wonderful caviar. Despite the guffaw with the steak, Phil did pretty well and I made sure to tip him accordingly. 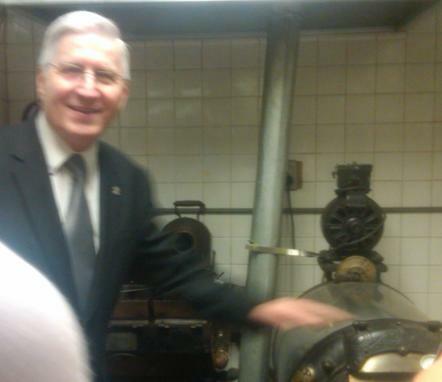 After paying, he escorted me to the kitchen for a tour of the restaurant/wine cellar. There happened to be another tour of the kitchen at the time, so I was shown the wine cellar and then headed upstairs for desert. I ended up getting in on another, much more detailed tour later on, so I will save that part for later. Upstairs at Bern’s they have roughly 40 different desert rooms. 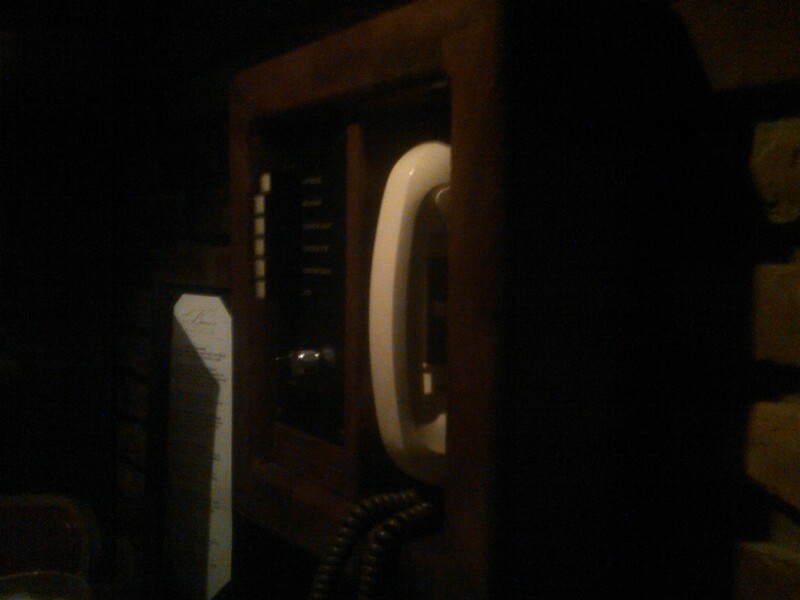 Each room has an old phone system placed in it, and at first I couldn’t figure out why. On the phone are a buttons for a couple different styles of music, which play over the speakers in your dessert room. I was informed there was Ken, the piano player was performing from their dance floor, and pushing the piano button would “stream” his music into your room. The cool thing is that the purpose of the phone is for making requests, which Ken seemed more than happy to do. I was treated to “What a Wonderful World,” in addition to other piano classics such as Indiana Jones, Star Wars, and of course the Mario Brothers theme song! 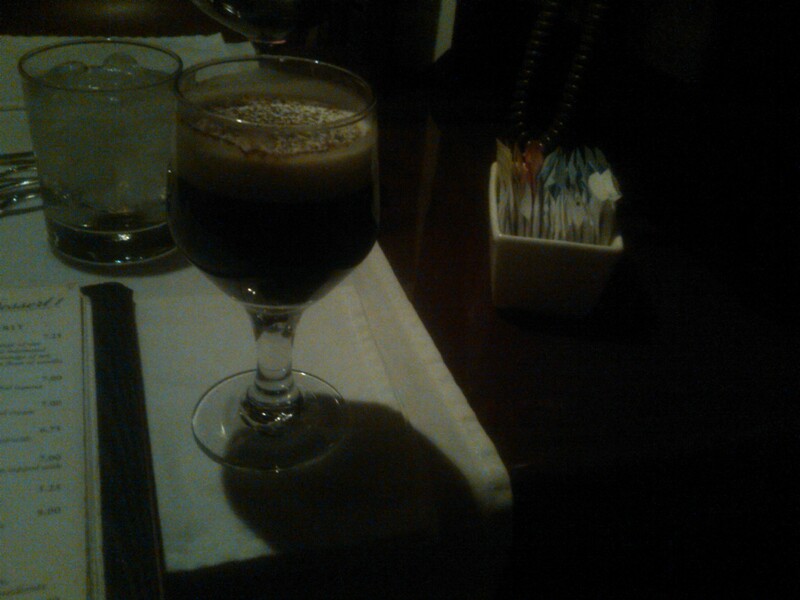 I ordered the Cappuccino Bern’s Steak House, which turned out to be marvelously exquisite, with a rich and creamy layer of froth. This long-time specialty features a marriage of our very-finely-ground, freshly-roasted coffee marinated in Kahlúa and flavored liqueurs for an average of ten weeks. Your cappuccino is topped with a float of vanilla cream and finely-ground coffee. With the title of best sundae in the world, I inquired if it would be complimentary if I did not agree. 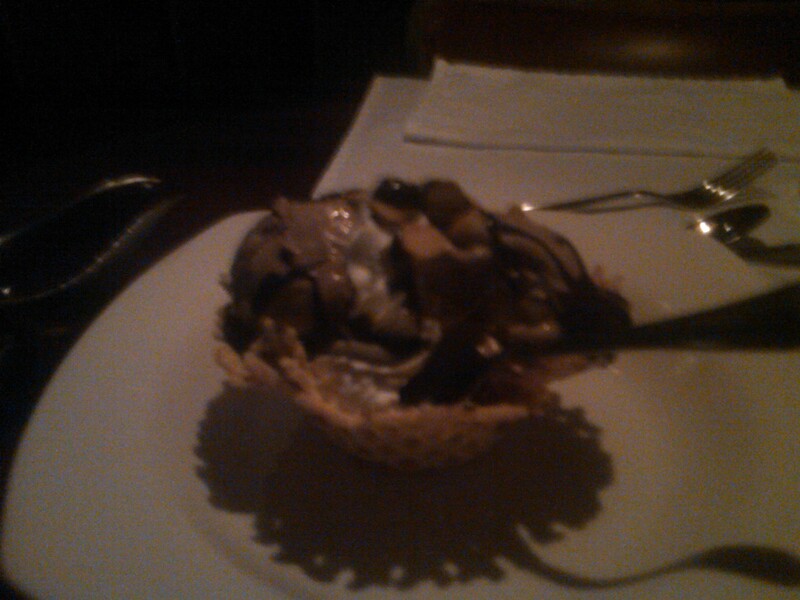 Macadamia Nut Sundae-Best I’ve Ever Had! Sadly, it was very likely the best one I ever had–no refund. The combination of fudge and vanilla ice cream was well accentuated by the macadamia nuts, and though I ate little of it, the cone had a sweet, succulent orange flavor. Miraculously, I finished the sundae, and had my cappuccino topped off a few times before heading to the piano room for a while. The extraordinary thing was that Ken seemed willing to take almost any request, and though he might take a look through a book of sheet music, would perform every song with absolutely no sheet music in front of him! What a delight to listen to! Eventually, I decided to head back downstairs to see about tour of the kitchen. I happened to arrive at the right moment, and since it was now nearly 11:00 PM and fewer customers were there, we were able to get a more detailed tour of the kitchen and wine cellar. It is a fairly impressive operation, given how the age and slice all of their own steaks upon ordering, chop their fresh salads and side items, and even roast and grind their own coffee. If you know anything about Bern’s, you may have been asking about the wine cellar. Frankly, there is just so much to cover, I haven’t gotten their yet. 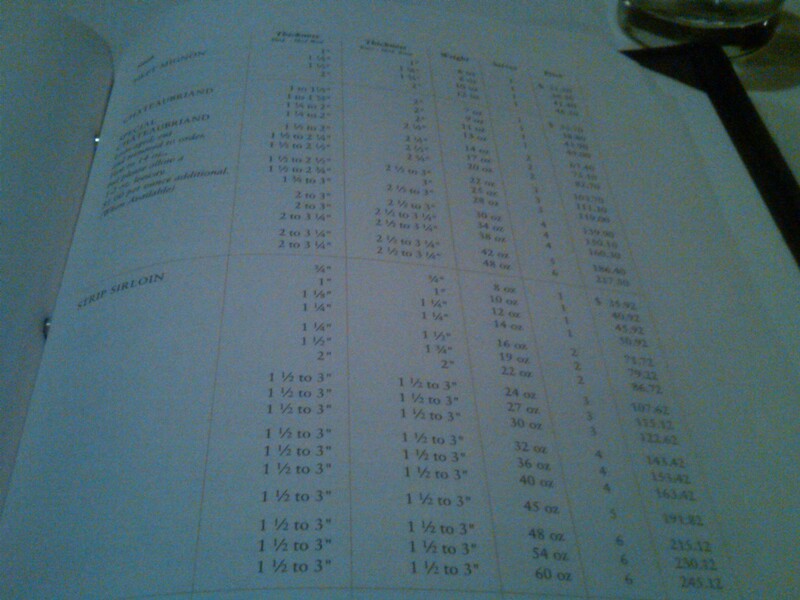 Their wine menu literally reads like a thick novel, without about 3,000 to 4,000 wine labels on it. 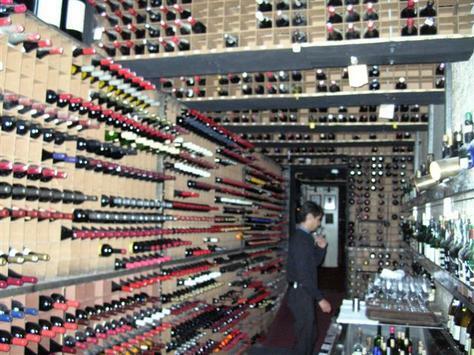 This actually represents just a small percentage of what their wine cellar holds on site–roughly 100,000 bottles. This only accounts for 10% of their entire private collection, which is the largest restaurant collection in the world. The remaining 900,000 or so bottles sit across the street in the gutted remains of what used to be a 3-story hotel, stacked floor ceiling with hardly enough room to walk sideways down the aisles. 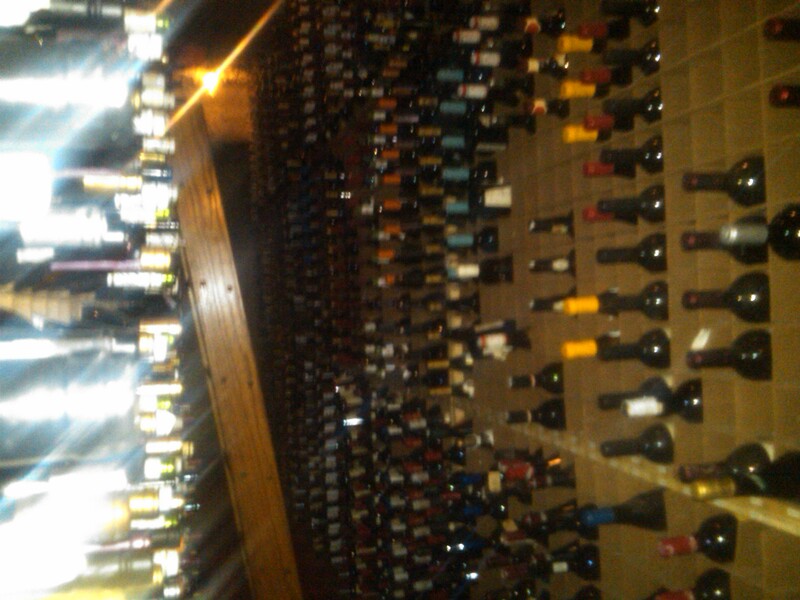 Anyway, the restaurant’s wine cellar is included as part of the kitchen tour, and it is surely a sight to see. The entire room is climate controlled at about 68 degrees and 70% humidity, and a rich, fruity wine aroma emanates throughout the entire cellar. Amazingly, the even have some wines dating all the way back to 1850, which I was fortunate to get a sniff of! Their most expensive wine is a magnum from 1947, that will set you back only a cool $30,000. Yea, I know. You can get a pretty good car for that price. Following the tour, I ended up talking with one of the waiters for a bit about the way that they do things, which was neat. Things like their waiters not being bothered by people coming in for a glass of ice water, or when the Secret Service came in recently with Hilary Clinton. And unlike almost every other restaurant in the world, the staff will stick around until the last customer in the restaurant leaves. Never will the turn the lights off on you or ask you to leave. Quite special, in my opinion. On the whole, I experienced PHENOMENAL customer service, from beginning to end. 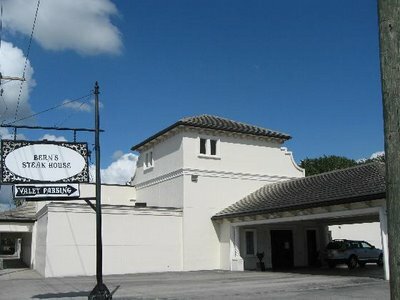 The experience at Bern’s Steak House is head and shoulders above almost any other restaurant in the world, and well worth visiting.